Links to pages of photos of our Brittany pups and their families, with comments from their owners. 1. Vanilla (male) - [Danner] Montana. 2. Clove (male) - [Wesley] Co-owned by three parties: Texas, Idaho, and us here in Montana. 3. Thyme (male) - Montana. 4. Basil (male) -[Basil] Montana. 5. Nutmeg (female) - [Tess] Oregon. 6. Rosemary (female) - [Cloe] Texas. Monty (Wyndy x Dante) with his happy hunter in Canada! Basil (Wyndy x Dante) with his happy hunter in Montana! 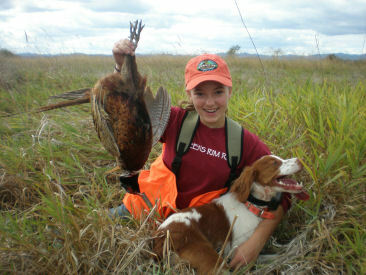 Annie (Wyndy x Redd) and her Kid - with a pheasant! Misty (Wyndy x Redd) (on left) after chukars with her hunters in Oregon. 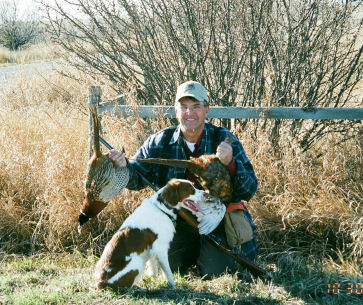 My Father with some of our dogs and a fetched pheasant, Dec. 2007. Annie and her happy owner Tyler after a good day of chukar hunting!! "Just wanted to give you an update on Annie. Wow, what a dog. 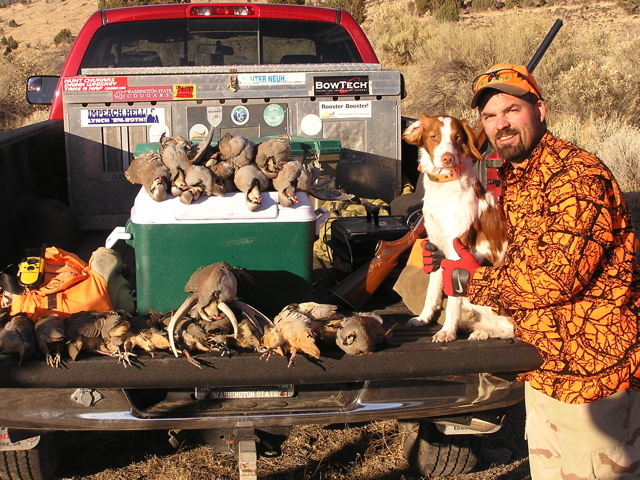 She performs great in the flat lands and the chukar hills. She is so strong on points and will find a dead bird. Still at 29lbs so light on her paws and small enough to get thru the thick cover. Keep up the good work breeding these dynamos! You can quote me as much as you want because I wouldn't say anything that I did not feel was true. And feel free to send potential customers for a referral interview because I only have high marks for Warbonnet britts. How old is Wyndy? I would like another pup out of her in the future if she is capable." Tyler 12/2006.